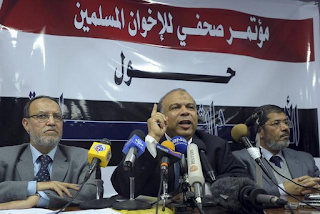 Stirring Trouble Internationally: The Egyptian Muslim Brotherhood Is Divided. Who Will Benefit? The Egyptian Muslim Brotherhood Is Divided. Who Will Benefit? The main political force in Egypt is known by some to be the Muslim Brotherhood. The known situation in Egypt during these times is the revolution, the radicals of Egypt argue this is not true, but most people know this is how they are happy to be known. The geopolitics of Egypt has both been debated and on the outside has been stirring trouble in the community. The debate is based on the usual divisions of labour and the gap between poverty and the middle classes in Egypt. To the Brotherhood this may appear radical. On the outside it does seem radical, but from the inside it is a different story unfolding. Political parties are pitting there wits to find some solutions to current issues and later issues that may also arise, many of these issues are spoke about in the article below. Stirring Trouble Internationally contributor James Anderson writes all the information he has gathered from the inside of Cairo's archives and current news. The radicals, who range from liberals to Trotskyites, accuse the Brotherhood of seeking an accommodation with the Supreme Council of the Armed Forces (SCAF).